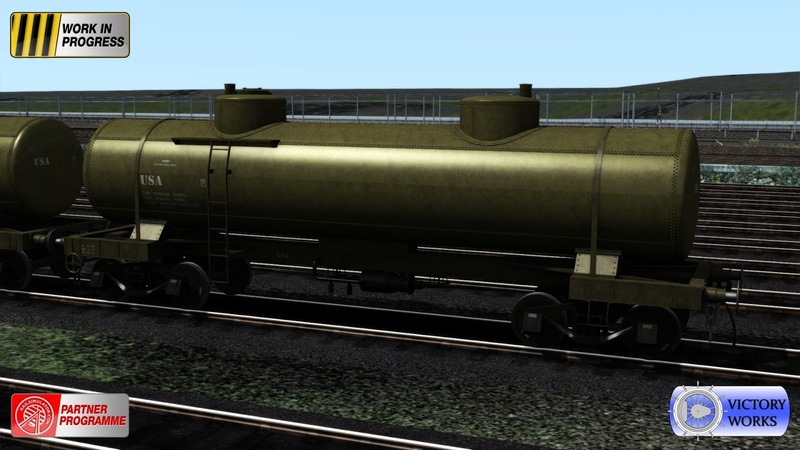 Over the past few weeks we have shown you all of the liveries for the S160 so now it's time to show the accompanying rolling stock. 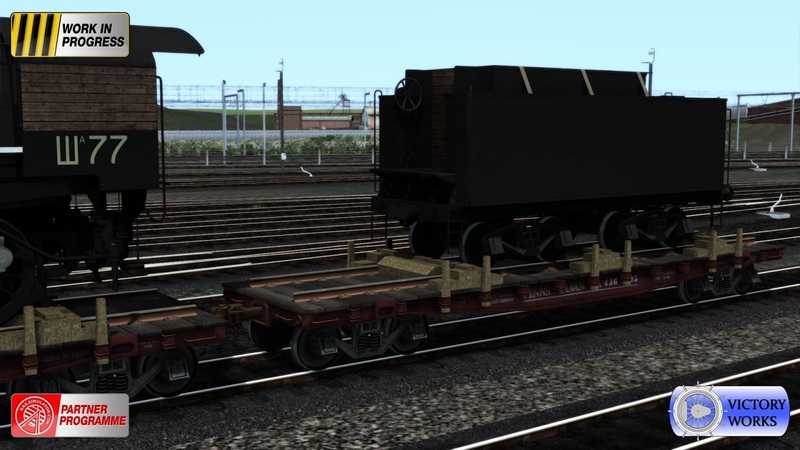 We start off with a very unusual and very heavy load. 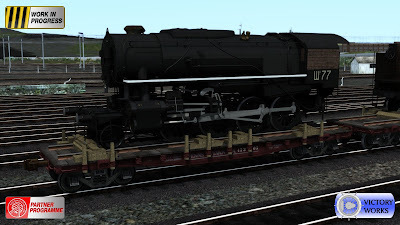 Of the 2120 S160's built, 200 of them were built for 1520mm gauge and shipped to the USSR. 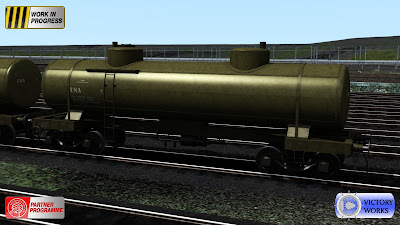 Named Ша (pronounced ShA) these locomotives built in the USA needed to be taken from the factory in Philadelphia to the coast for shipping however due to the difference in wheel gauge they couldn't simply be pulled on the track. So the locomotives and tenders were loaded onto flat cars and thanks to DTG allowing us to use their 40ft flat cars we have been able to reproduce this from a photograph provided by our Russian friend Artem. 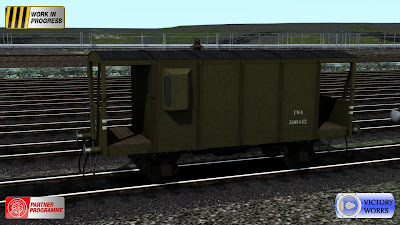 One of the included scenarios has a consist of these being pulled by two S160's and banked (attached at the rear) by another! 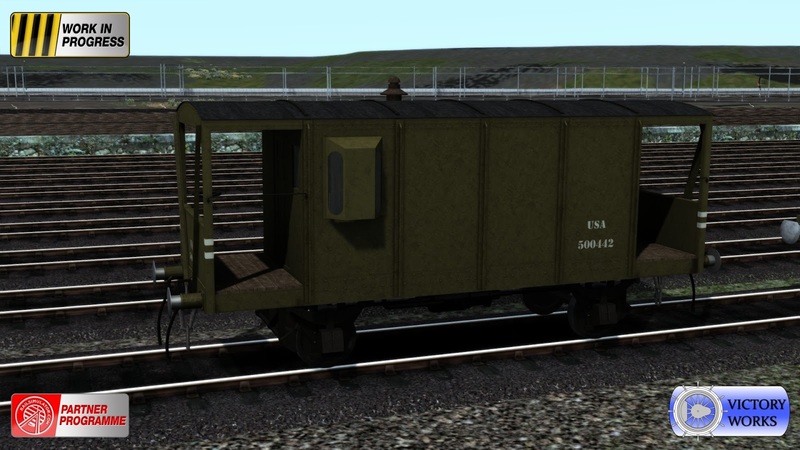 Scenarios for the route are currently in progress and we can confirm that there will be scenarios for multiple routes using relevant liveried S160's so when purchasing the pack you will hopefully own at least 1 of the routes and have some pre-made scenarios to play. There are also 68(!) included Quick Drives so even if you don't own the selected routes you will have a lot to play with. 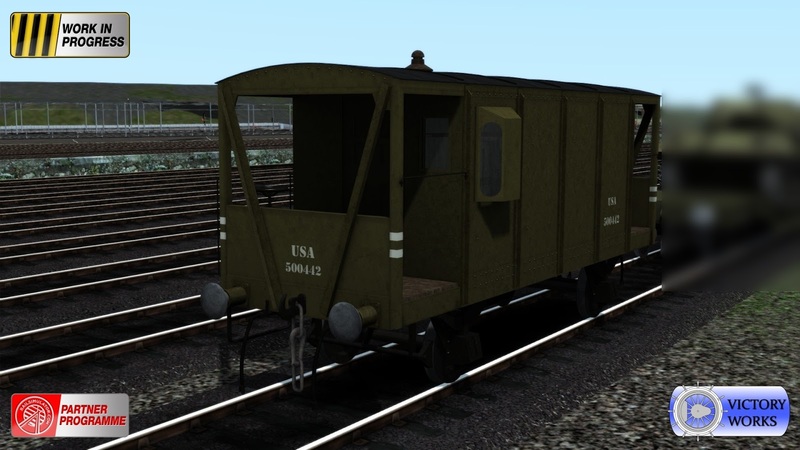 Moving on with the rolling stock we have below the start of the USATC lend lease equipment. 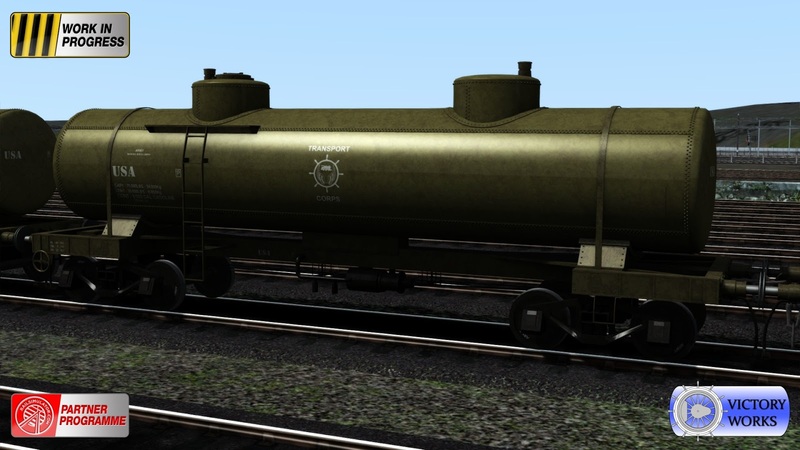 This was rolling stock produced in huge numbers in the USA and shipped all over the world to help the allies, like the S160 itself, and much of it remained in use after the war as countries began to rebuild. The 9,900 gallon tank. These were used for transporting all kinds of fuel for ground vehicles and aircraft. 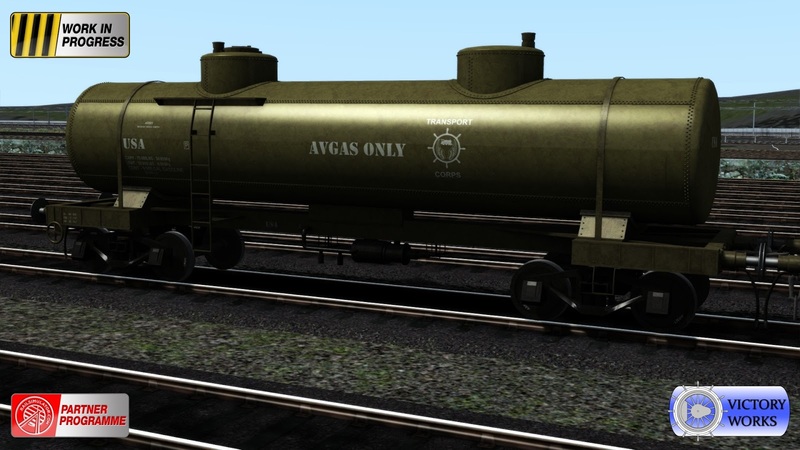 We have created 3 liveries including one specifically for aviation fuel. The tanks are available with hook and buckeye couplings and air braking, although we have 2 photographs showing Newport Ebbw Junction packed full with them prior to Operation Overlord so we expect that they were often pulled as unfitted stock as well using local British locomotives which were only fitted with vacuum brakes. 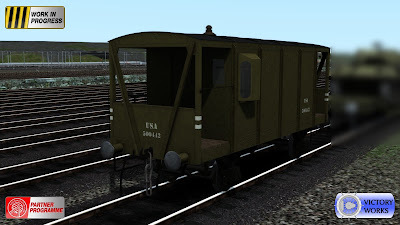 The USATC also produced many brake vans (cabooses) for use overseas and we have produced the simple 20 ton version made of a basic chassis topped with metal bracing and a thin plywood frame. 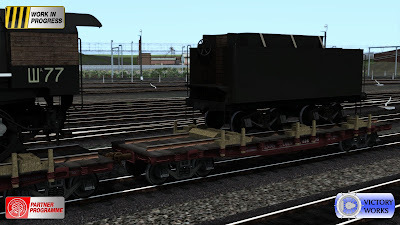 Also available with hook and buckeye couplings and air braking, with a guards view and animated hand brake. Hey Victory Works.. what's that blurry mess on the right of the last picture? Can you add more railguns, tanks and howitzers please? I would love to have more of it for my series, The Hinterlin Academy! on youtube. (DTG/TS Rewards) American Military Flatbeds. So can you please do some more of those please?